On our summer vacation we did not take any long trip anywhere abroad. That is quite exceptional, I cannot remember the last vacation we had took without any bigger trip. I must admit I was a bit sceptical if the vacation would feel like a vacation at all because we did not have anything planned. But in the end we did so many different things that the two weeks of vacation feels way longer. Our vacation started on Midsummer which we spent on a friends' cabin near Loviisa. 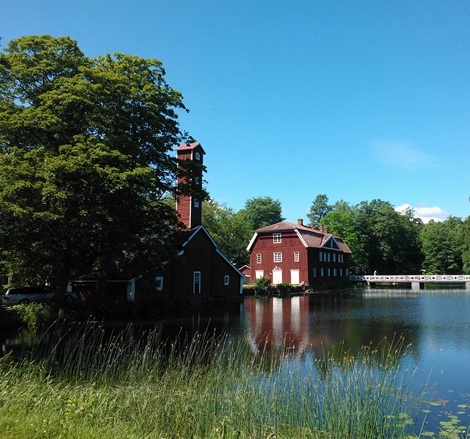 From the cabin we made car trips to Loviisa town and to Strömfors iron mill area. So even the first few days of the vacation were active. After the Midsummer we returned home and booked a trip to Tallinn for the next day. 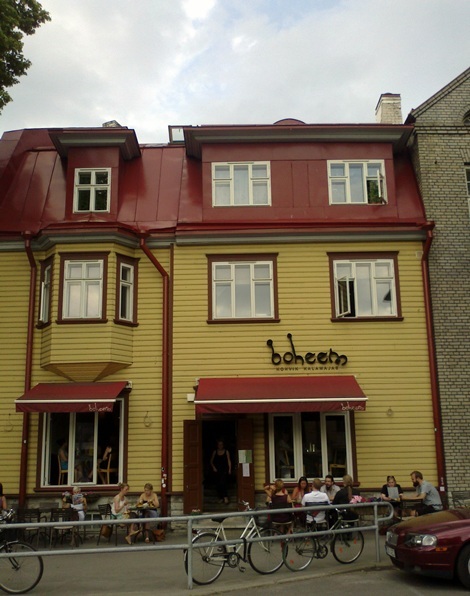 I had never spent the night in Tallinn so we desided to stay there for one night. When we arrived to Tallinn we were greeted with heavy rain. We walked to a crafts shop Karnaluks and our shoes were soaked with water and for the whole trip those just did not dry. It was unbeliavably humid and hot on those two days, like in a rainforest. We arrived to the Karnaluks craft store only an hour before closing time. I had read about that shop from many many craft blogs and knew that it was well equiped. But oh my it was huge! And not only was it huge but it was packed, there were shelves so close to each other that it was sometimes difficult to move between them. I wondered between the shelves and was so amazed that I could not even deside what I should buy. So of course the next day I had to return to the store with a shopping list I made on the evening. I spent at the shop a good two hours while A visited the Lennusadam. We did not spend that much time in the old Hansa town of Tallinn this time but visited lots of other areas. 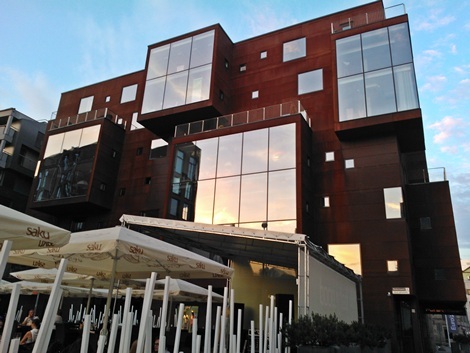 I had never realized how much there is to see in Tallinn, we could have spent there way more time than we now did. After our Tallinn trip we spent one day at home and I was able to continue some projects on the back yard. Then we spent one day sailing. It was our first sailing trip together with our new boat, we had a bit rough wind and had some trouble with a leaking toilet seat, so the first trip we took was not very pleasant. Next day again I spent at home finishing some projects and A was fixing and cleaning the toilet at the boat. Then we took a short sailing trip to a close by island where we stayed one night at Gula Villan restaurant's pier. The wind was just perfect and we had a really nice evening at the island. Then we took another sailing trip with a friend couple to other friends' cabin. Our friends had never sailed before and we warned them that it might be cold and rough on the sea even though at land it might feel very warm. But we had tailwind and on one point it got so hot that we were even able to dress only in bikinis while sailing. One night was spent at friends' cabin and on the next day we sailed back. This time we did not have tail wind and it felt colder, but yet the wind was just perfect, not too rough, and we had a very nice sail back home. Sun was shining all the time and the freckless on my face multiplied. 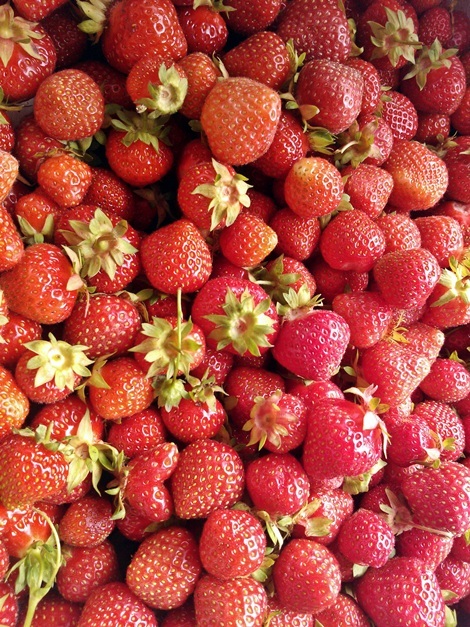 Next day after the sailing we visited a friend's parents' strawberry farm and self picked lots of strawberries. Then we went to my parents' cabin. At the cabin we warmed up the sauna and waited for something remarcable; my sisters return from the Netherlands. Yay! She is now back in Finland! We ate huge amounts of strawberries and chit chatted, had a sauna and swam in the lake. So nice to have her back. Then we went to A's parents' cabin for one night. Again we had sauna there and swam in another lake and did some BBQ and ate toasted marshmallows. In a nut shell we visited four cabins, had one small trip abroad, finished one big project on the backyard, sailed for five days and met lots of friends and family. Nice active vacation. It couldn't have gone any better. Nice to have you back! Sea, strawberries and swimming (+sister), couldn't get better! Sounds like a lot of fun, and it was productive, that's the best combination. :) The craft store sounds amazing, you're so good to go back and make a list before purchasing anything, great self-control. It's really fun being introduced to the places you go. I never thought much about Finland (or Estonia) before reading your blog and it looks wonderful there. I was so overwhelmed in the craft store that I just did not know what to buy. I'm happy you are enjoying the places I've shown. One day you could come for a visit and have a north Europe tour. I had not had paid vacation in years, because I've quite often changed my workplace. But now finally! But I have taken unpaid vacation earlier and often for two weeks, usually it is not an issue here to take few weeks in a row. Everyone else is on holiday anyway.